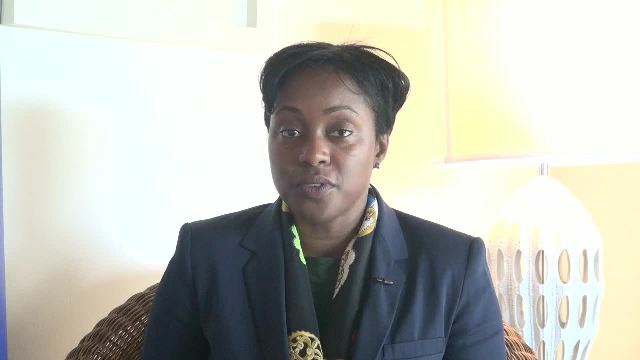 NIA CHARLESTOWN NEVIS (MARCH 28, 2017) — Dr. Tres-Ann Kremer, Political Adviser with responsibility for the Caribbean at the Commonwealth Secretariat, praised the Ministry of Social Development in Nevis Island Administration (NIA) for its efforts at mobilising the region in the implementation of the United Nations Agenda 2030 Sustainable Development Goals (SDGs). She said the effort mobilises the region towards building capacity for government institutions, to help raise awareness and develop a plan on how the region could approach gender disparity and issues around women and gender which would pave the way for accelerating the SDGs implementation. Dr. Kremer, who spoke to the Department of Information at the end of two-day Sub-Regional Forum for Women on the Sustainable Development Goals, hosted by the Ministry at the Mount Nevis Hotel, described the response from participants as heartening. She said it was clear that delegates found the forum very useful. It also provided impetus to the efforts that are being pushed in the various governments of the region. The forum was supported by governments from across the region and multi-lateral institutions including representation from the Commonwealth Secretariat, the Organization of American States (OAS) and the United Nations Development Programme (UNDP). Meantime, in an invited comment on the implementation of the SDGs, Dr. Kremer explained, that one that awareness is critical to the implementation and believes that the conference was successful in raising awareness. “I think this conference did just that – raising awareness in the region about the importance of gender in achieving the Sustainable Development Goals, in particularly Goal 5 which deals with gender equality in all spheres of life and in particular Goal 16, which speaks to inclusiveness across areas, in order to enable access to justice and also peaceful societies globally,” she said. Dr. Kremer, also stated that in the region, there is a good response to gender equality, especially as specific actions have been identified by various focal points, in terms of moving toward the implementation of the SDGs.